We chose the serves 10 for 2 reasons. One, the serves 6 came hot. The serves 10 came ready to cook. 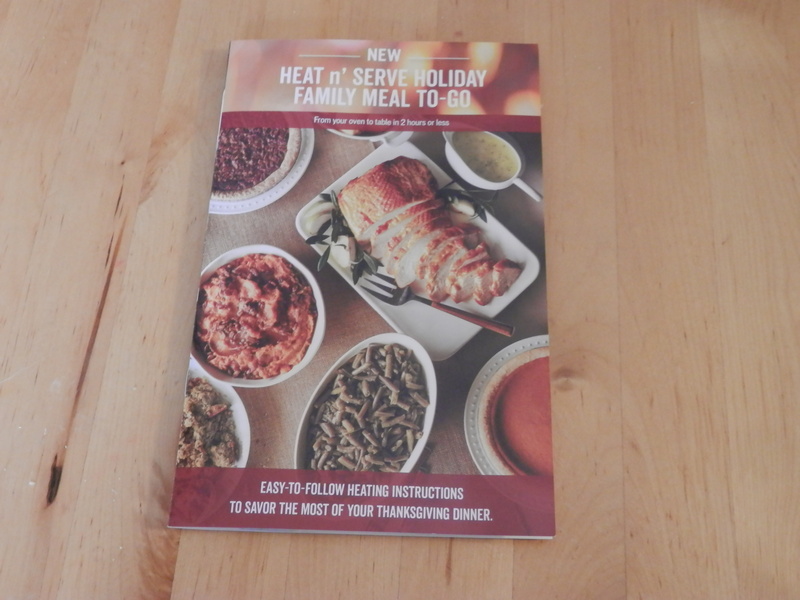 I wanted our meal to be freshly cooked, not precooked. The other reason is because we don’t eat pork, so it was useless to get the one with the ham. 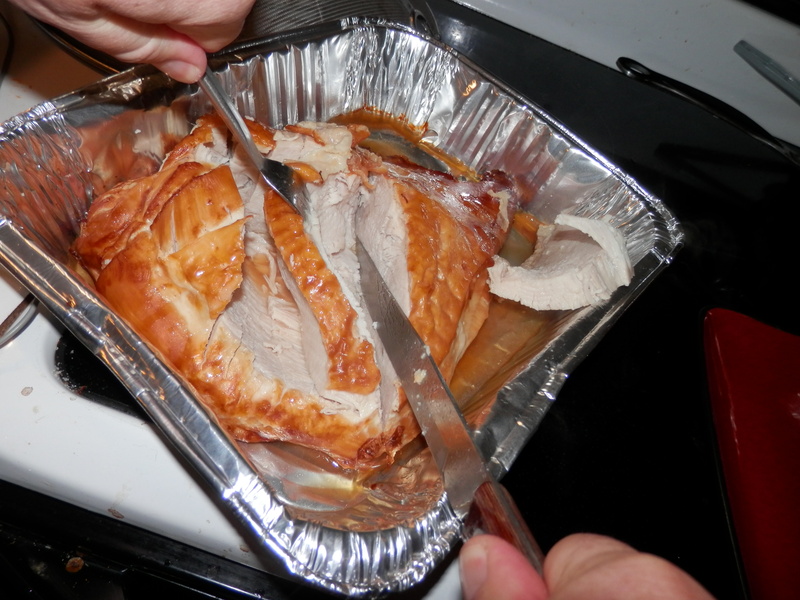 Also, the serves 6 just comes with “turkey and dressing”, whereas the serves 10 comes with an actual breast. I placed the order the weekend before online, and we went to pick it up Wednesday morning before Thanksgiving. It came in a big box, especially made for it. It barely all fit in the fridge! 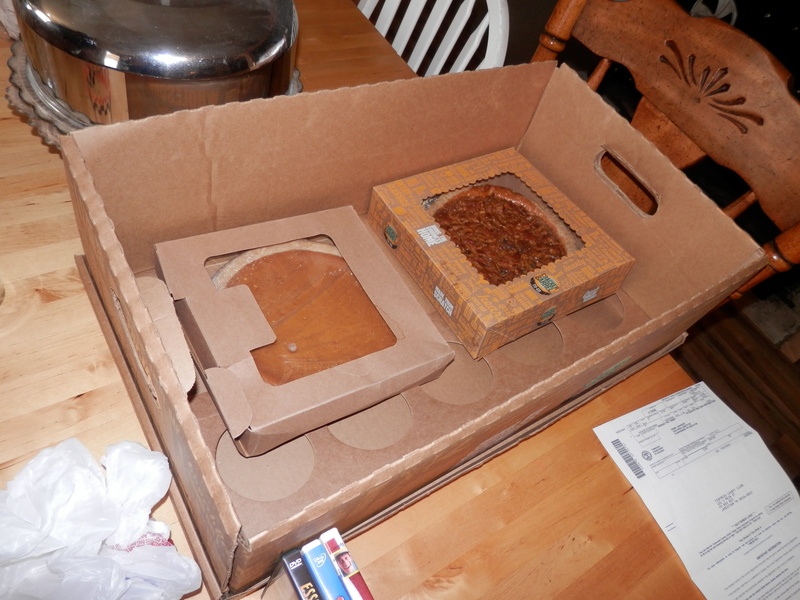 Here’s the box with the two pies in it. Here’s the instruction manual that tells you how to do everything. Here’s all the food. 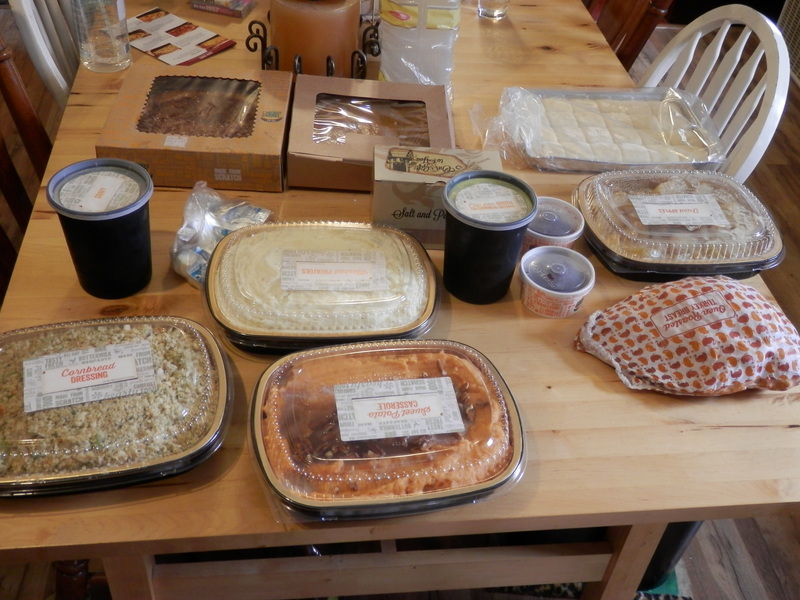 Our sides were stuffing, sweet potato casserole, mashed potatoes, and the apples. Note the small bag of individual butter servings. The turkey is in the patterned bag, bottom right. It also came with a complimentary set of salt and pepper shakers that look like little acorns. Cute, but we don’t need any more salt and pepper shakers. 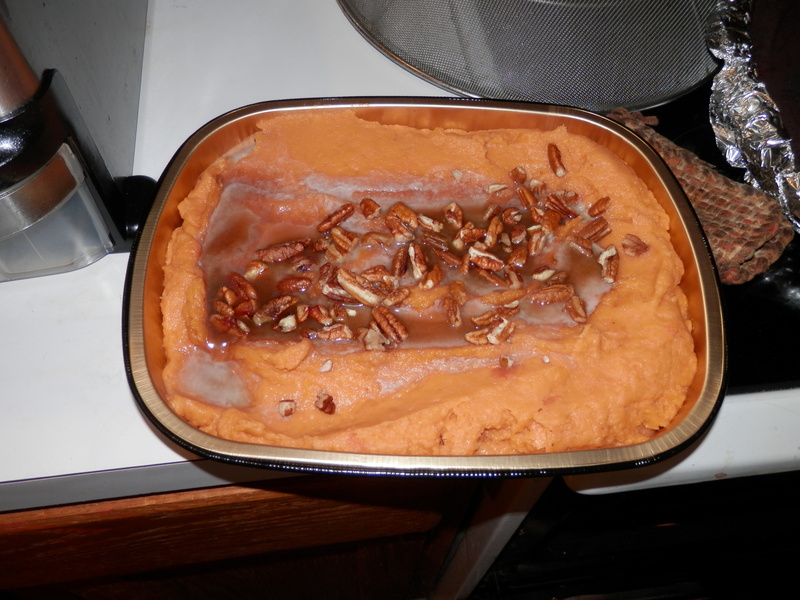 I was not impressed with the way the sweet potato casserole looked with the topping all globbed in the center like that, but the topping did seem dispersed after cooking and serving. The instructions were great, and here’s why. All the food cooks at the same temperature. So if you’re oven is big enough, you can fit it all in there without having to wait on anything. The turkey took the longest, so I put it in, waited the certain amount of time, stuck in a side, waited, added a side, etc. The lids come off, and the sides stay in the pan they came in-convenient! Save the lids for putting the food up later. The mashed potatoes required a separate dish, as their instructions were using the microwave. 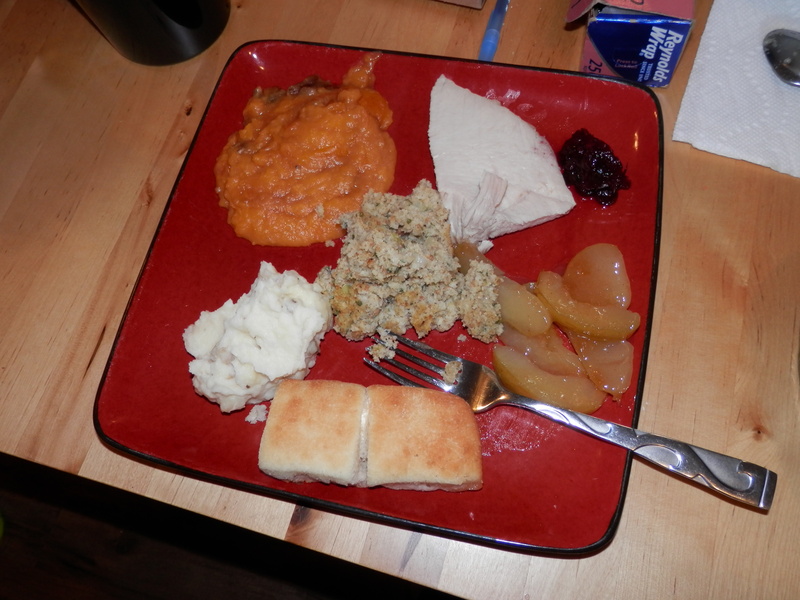 The stuffing had to be mixed with provided chicken broth. It was runny, but cooked to a nice consistency. The turkey took longer to cook than expected, but things happen like that all the time. Here’s the turkey. 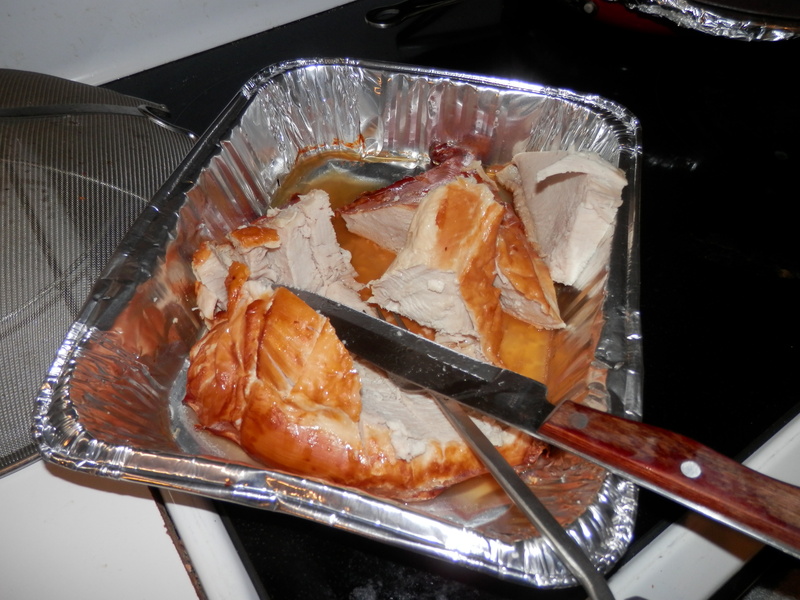 Here’s the turkey after 4 people got served. Now remember, this is supposed to serve 10. It could very well serve 10, but I’m sure most homes are going to eat more than their “allotted servings”. Keep that in mind if you decide to order this. Now for the important part, the flavor. (based off of all four people) The turkey was moist and tasty. It had obviously been seasoned. It was not a breast like a Butterball. It looked like it had been messed with somehow. The yeast rolls were like cornbread biscuits. They weren’t bad, they just weren’t yeast rolls. Not at all. The stuffing was some of the best stuffing I’ve had. The apples were good; the mashed potatoes were good (neither the best I’ve ever had, but certainly nothing to complain about). I don’t personally like cranberry relish. I want my cranberry sauce to look like it just came out of a can and got sliced, not some gourmet looking froofroo to make a bunch of used-to-be yuppies (now middle aged) feel special. However, this relish was good. And then…. stay away from the sweet potato casserole. Trust me. Don’t go there. Just don’t. It tasted like someone added a jar of lemon juice to it. NOT good. It tasted nothing like sweet potatoes, and no, that doesn’t mean that if you don’t like sweet potatoes you’ll like this. You won’t. The pecan pie was decent, again, not the best, but nothing to complain about. The pumpkin pie was very good (or so I’m told. I can’t bring myself to eat pumpkin pie). We’ve all seen it, the giant list of “FREE on Kindle!” ads that infiltrate every web page, tweet, or e-mail known to man. But why? Self-published authors don’t have thousands of dollars to throw into marketing and publicity. We don’t have all the connections that big publishing houses do, so we have to do it the best way we can. See, publishing houses send their books to certain people/connections they have, and those people publish a review of the book in their little magazine. Those magazine get sent off to book stores and libraries, and the reviews get quoted on the books and the books’ sale pages. These reviews cost money whether in shipping free book(s) to them or paying for them, or in building up the relationship required to get said books reviewed. They also cost years of time investment. We don’t have that. So, we offer our ebooks for free here and there. But again, why? Because Amazon doesn’t like reviews from people who haven’t bought from them. They will actually go through and delete reviews at their beck and call. By having the book free, the review is still from a “verified buyer”. It also brings the book to attention. Amazon will promote those books that are new or hot, even if they’re free. This draws attention to the books for a while after the hotness wears off. It’s a slow dive down. It also draws attention to the other books the author has written, sometimes resulting in sales. But what if I didn’t like the book? Well, there’s a catch 22 there. The author needs a certain number of reviews to be taken seriously, especially by Amazon, even if the reviews are bad. Amazon will put higher review numbered books on top of lower reviewed books, resulting in even more publicity for the ones that need it less (ya gotta have money ta make money). But, I don’t leave bad reviews on any self-published work. (that I know of) I’m friends with too many of them, and that could get awkward. So, if I don’t like their book, I don’t leave a review. I want readers to be honest, but I don’t want bad reviews anymore than the next author, and I need reviews as much as the next author…sigh…so it’s a catch 22. I’ve heard a lot of people say they’re surprised at the turnout of this election. I don’t understand this. Wasn’t it common knowledge the political surveys were skewed? Didn’t we tell people that? Deaf ears, I guess. Here’s what happened when I took a survey, and I took a LOT of surveys. See, when one party called, they would ask who I would vote for in several categories of elections, representatives, current issues, and yes, the Presidential election. But when another party called, they immediately started out with, [would you vote for] “REPUBLICAN (state representative) or DEMOCRAT (state representative).” Those words are capitalized for a reason. They were highly emphasized in the question. If I said the name of the Republican candidate, they immediately hung up. If I said I was undecided or chose the Democrat candidate, they went on to ask about the Presidential choice. See what they’re doing there? They’re screening out who votes the way they don’t want in their polls, making their polls screwed. But what about the other side? The other side finished every poll, even when I said Democrat names, and even thanked me for taking the survey. Oh, and they did not emphasize political party names. In fact, some of them didn’t even mention the political parties the candidates were associated with. And that, dear friends, is why the polls were skewed. I would say that “maybe this will teach people not to trust the media and to look things up for themselves”, but I know better.